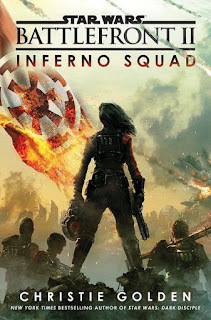 The first portion of this review is SPOILER FREE, but the second portion will address the novel in detail and is intended for fans who have read Inferno Squad already. The separation will be clearly marked. The last time a tie-in novel to a Star Wars Battlefront video game was released two years ago, there was little connecting the two beyond their title. 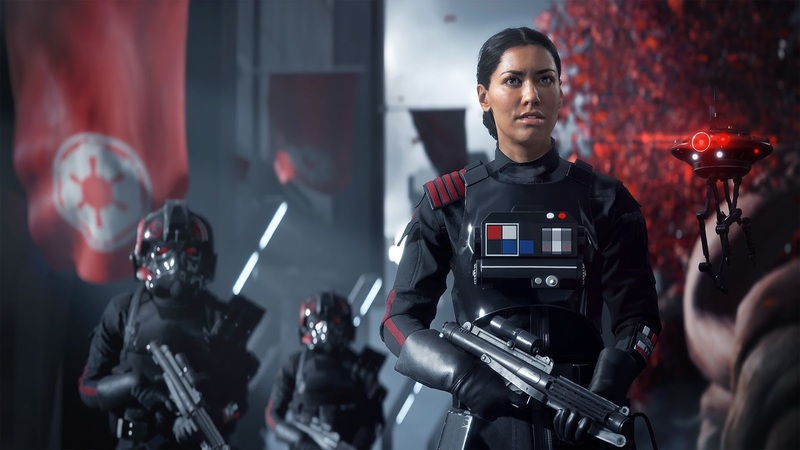 But the same cannot be said this time around as Christie Golden's Star Wars Battlefront II: Inferno Squad serves as an origin story of sorts for the characters we'll be seeing in EA's video game when it hits shelves this November. In fact, one of the book's strongest features is the way it ties into many previous installments in the Star Wars canon. Inferno Squad seamlessly connects elements from Rogue One, A New Hope, Beth Revis' YA novel Rebel Rising and the animated series Star Wars: The Clone Wars with characters from the upcoming video game that will explore the rise of the First Order--thus tying it all into the sequel trilogy as well. Golden does a masterful job of connecting these elements in a way that is rewarding to fans who have been following all the various projects over the years, but isn't off putting for those who only watch the movies. But references aside, the story of Inferno Squad leaves something to be desired. It can't be denied that Inferno Squad is a bold concept. It's rare to see a Star Wars novel told entirely from the perspective of Imperials--and not Imperials who are having doubts either! The members of the titular squad are true believers. Having them go up against what's left of Saw Gerrera's Partisans (the extremist rebels seen in Rogue One, who parted ways with the Rebel Alliance after their methods were deemed too "unconventional") also made for some uncertainty about who the "good guys" really were. Unfortunately, part of Inferno Squad's bold concept wound up being its greatest weakness. The novel takes too long to get going and because the members of Inferno Squad are Imperial true believers through and through, there isn't much room for character development. Iden Versio, Del Meeko, Gideon Hask, and Seyn Marana are essentially the same people from the start of the novel until they arrive at the Partisan outpost. Granted, there is some Versio family drama thrown in to shake things up a bit, but it just isn't enough to justify the amount of time spent between the formation of Inferno Squad and the start of the mission against the Partisans. Once the mission begins, however, things pick up and the novel starts to live up to its concept. Golden does a great job of presenting the psychological toll of the events depicted, and the way in which Iden goes about infiltrating the Partisans leads to one of the novel's most emotionally devastating moments. A moment that will be topped later, once the members of Inferno Squad are fully ensconced within the enemy. The Partisans provide a much needed shake-up to the monotony of Imperial life, injecting new energy into the story line as they begin to challenge the members of Inferno Squad in new and interesting ways. The ways in which the various members react to life with the enemy offers insight into the characters in ways we didn't see when they were going on "safe" missions in the early chapters. Suffice to say they all react differently and the outcomes are not always what their superiors might hope. It's also worth noting again that the Partisans are not the rebels we're accustomed to from the Original Trilogy or Star Wars Rebels. They are brutal. They do make you question if they really are the “good guys.” A criticism of Rogue One has been that we keep hearing about Saw Gerrera's extremism, but we never really see any of it. Inferno Squad answers that criticism and then some as we see just how brutal Saw’s followers can be. This is not the rebellion of Luke and Leia (or even of Jyn and Cassian); it is something completely different and it was great (if at times horrifying) to see Golden embrace that. Inferno Squad suffers because of its slow start and the novel takes a while to begin to live up to its potential. Even then I wouldn't say it fully reached the heights it could have. In some ways it's ironic that the rebels would turn out to be most compelling part of an Imperial-centric novel. But the Partisans allow us to take a deep dive into an area of Star Wars that has barely been explored to this point: the dark side of the rebellion. War is a complicated mess and Inferno Squad tackles that idea in a way that few Star Wars stories have. Below are some spoiler-filled thoughts about Inferno Squad. These are intended for fans who have read the novel or just don't care about spoilers. If you plan on reading Inferno Squad, and don't want to know anything more, stop reading now. This is your SPOILER ALERT! I'll admit, I caught onto this twist fairly early on. I'm not sure whether it was my love of The Clone Wars that tipped me off, or the fact that I saw that there was a fan made YouTube video released recently titled something along the lines of "What happened to Lux after the Clone Wars." I'm going to go with the latter, even if I haven't actually watched the video yet. And, I'm not complaining by the way, I actually don't mind being spoiled on things (listeners to The SWU Podcast will know this). Knowing (or at least having a strong suspicion) that "The Mentor" was actually Lux allowed me to appreciate some of Golden's more subtle foreshadowing. Lux is a character I enjoyed seeing on The Clone Wars, mostly because of his interactions with Ahsoka. Ahsoka is never mentioned by name in Inferno Squad, which is fair--there was no need to drag her into this--but it does make me a little sad that he and Ahsoka likely never reunited. Though both seemed to have outgrown their mutual crush by the end of the Onderon arc of The Clone Wars, it would have been interesting to see these two interact following the events of Season five. When it was announced that Forest Whitaker would be playing Saw in Rogue One, I did fleetingly wonder what happened to Lux, given that he was a key player in the arc that introduced Saw. Like many of the "good guys" of this era, his story turned out to be appropriately sad. Lux always seemed to be caught between various ideologies, and it's fitting that he would continue to be so once the Empire rose to power. His mysterious step-daughter is someone that I would be curious to learn more about. Perhaps she may turn up in the video game? I'm curious to see how much of the novel is actually referenced in the story of Battlefront II. Speaking of things that could impact the story of the video game, it's strongly implied that Iden didn't actually kill Lux, that she merely stunned him and left him alone on the planet where the Partisans had their base. Iden clearly admired Lux, who, of all the Partisans, definitely made the biggest (and most positive) impression on her. Letting Lux live, even if he is deserted on a mystery planet in the Outer Rim, doesn't seem like the action of the true believer that we had been led to believe Iden is. Iden had justified killing children in the name of the mission and the Empire, so why would she let some poor old senator live? Lux still has several key pieces of Imperial information that he never gave Staven, so he could still be a threat if he manages to get off-world. Does this loose end suggest that maybe Iden will have second thoughts about the Empire/First Order in the game? That seems like a stretch--my money is still on Iden being the Imperial patriot we're lead to believe she is--but it's an odd choice. But enough about Lux; let's talk about Iden's relationship with her family. The Iden/Garrick relationship is the latest in what seems to be a long line of dysfunctional father/child relationships in Star Wars. It drives a lot of the action early on, and it's clear throughout the book that Garrick has made a huge impression on Iden. What distinguishes this relationship from other dysfunctional father/child relationships in Star Wars is that it's more grounded. Garrick isn't the most evil person in the universe, like Vader (while to the audience he seems pretty bad, to Iden he represents all that is "good" about the Empire), nor is he secretly working to undermine the Empire, like Galen. Instead, Garrick sets his expectations for Iden extremely high and won't give her the approval she seeks, even when she meets them. In contrast to some of the other father/child relationships in the Star Wars saga, the Garrick-Iden relationship seems realistically drawn from the real world. You can imagine it playing out in some gritty, realist drama--unlike Luke and Vader which seems tailored more specifically to the genres of science-fiction and fantasy. I have to applaud Golden for paying off this relationship in a meaningful way at the end of the book. Garrick's revelation that he did indeed tell Iden's mother that Iden's betrayal of the Empire was a set up, felt like a fitting conclusion to their story arc. It will be interesting to see what their interaction is like when we see them again in Battlefront II. From the trailers, it appears Garrick will give Iden the order to seek out the Star Destroyer Eclipse (see Aftermath: Empire’s End) and the Imperial forces that will, presumably, begin the transition from Empire to First Order. Now that we know Garrick has a softer side, how will he square that with giving his daughter these most unusual orders in these most uncertain times. Moving from one Versio parent to the other, Zeehay Versio, Iden's mother only appears in one scene, yet her presence is felt throughout Inferno Squad. Perhaps the best and most moving scene in the novel occurs when Iden sees Zeehay's message telling her she doesn't know if she can forgive Iden for deserting the Empire. This is what I referred to--in the spoiler-free portion of this review--as "one of the novel's most emotionally devastating moments. Iden's anguish when confronted with her dying mother's reaction to her apparent betrayal is tragic and heartbreaking. It serves its purpose though, as this scene more than any other shows just how committed Iden is to her cause. She is willing to let her mother die thinking her daughter betrayed everything she stood for. Now, if that isn't loyalty, I don't know what is. Let's talk about the other members of Inferno Squad, starting with Seyn. Poor Seyn. You had to know she was marked for death when all the other characters had actors playing them in the game and she didn't. Golden still did an excellent job building to her death, as we witness her become close with certain members of the Partisans. So close, in fact, that she makes a fatal mistake and her true allegiances are revealed. It's interesting that even though various members of the squad gain affection for some of the Partisans, no member of Inferno Squad ever questions their loyalty to the Empire. Even when Seyn accidentally reveals herself she remains loyal to the Empire. It seems like somewhat of a missed opportunity not to have at least one member of the squad wonder if they're on the wrong side. Even if they never actually turned, it could have at least set up an interesting scenario where the Partisans could do something so horrific it convinces them that the Empire really are the "good guys." That being said, I don't want to spend too much time "Monday morning quarterbacking" the novel, so let's move on. There's not much to be said about Gideon. He's brutal. He's charismatic. And he's probably my favourite member of the team at this point. In some ways, he's like an Imperial version of Zeb from Star Wars Rebels. However, hopefully Battlefront II will avoid some of the pitfalls Rebels sometimes fall into with Zeb where he schtick can become very old very fast. As for Del, he found himself in a similar situation as Seyn, developing a lot of affection for one of the Partisans--even contemplating ways to get him off-planet so as to avoid the fate that befalls the rest of the Partisans. However, unlike Seyn, Del never acts on it, and his buddy Piikow dies when Gideon takes out the surviving Partisans at the end. Del confesses his sadness over this to Iden. If any member of Inferno Squad were to desert the team during Battlefront II, my money would be on Del. But in the end, while he seems more compassionate than the other members, as with Iden, I don't foresee Del actually deserting. Inferno Squad showed us a version of the team that was completely loyal to the cause and to each other. This was fine for the book, but I hope to see this dynamic challenged in one way or another in the game (perhaps the collapse of the Imperial command post-Endor structure could lead to some disagreements among the squad?) We’ll find out when Star Wars Battlefront II hits shelves on November 17th.